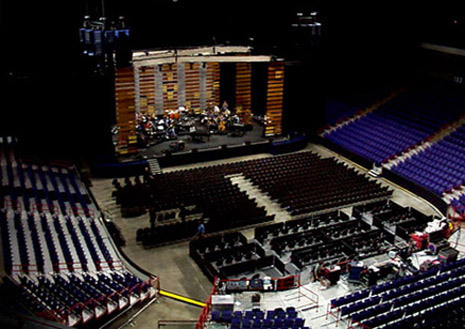 The Star Theatre at the Spokane Arena was created due to the demand for a smaller, more intimate concert space within the Spokane Area. Its 5,900-seat capacity fills the void left between the Spokane Arena (capacity 12,500) and the INB Performing Arts Center (capacity 2,700). Reconfiguring the Arena to reflect smaller capacities is accomplished by the placement of a large curtaining system within the Arena bowl and by utilizing other dramatic elements such as large entrance banners, stylish marquee and special chandeliers. The Star Theatre creates its own unique identity within the entertainment industry. It is a groundbreaking venue which provides an enticing alternative for major attractions considering Spokane as a viable location to bring exciting entertainment.